​Feet come in all shapes and sizes—and with a variety of arch structures, too. Cavus foot refers to an arch shape that is abnormally high and curved. Just as a low arch can lead to flatfoot problems and foot pain, high arches also come with their special challenges. Let’s take a look at why they occur and what you can do to lessen any complications from them. Many times a neurological condition is to blame, such as cerebral palsy, polio, or stroke. If this is the case, the problem will likely get worse over time, and can lead to additional problems such as foot drop. Sometimes, however, the foot structure is an inherited condition, which changes the outlook. The shape of your foot will probably not alter much over time, and you may not need the same treatment. This foot structure can be easily seen, because the arch doesn’t relax even when standing. Sometimes the top of the foot may even look high and rounded. You may notice that your ankle seems unstable, and there may be pain along the outer ankle and the outer side of the foot. In addition, calluses may develop along the outside of the sole because of the extra pressure. They can also develop on the heel and ball of the foot, because that’s where most of your weight rests with this condition. A common complication is that the plantar fascia under the foot that supports the arch is stretched too far during your stride, leading to damage and resulting in heel pain or inflammation of the tissue. Severe cases can also lead to stress fractures in the foot. 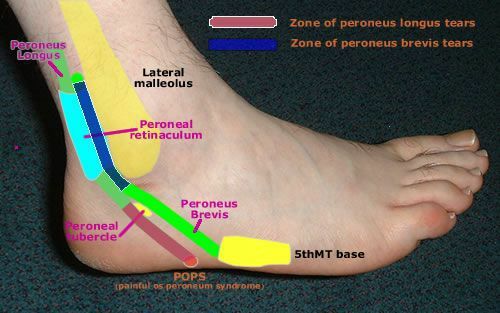 Peroneal tendon issues. The peroneal tendons are located on the outside of your foot (pinky toe side) and help stabilize your ankle, as well as roll the foot outward (eversion) or flex it downward (plantar flexion). High arches forces these tendons to work harder and expose them to extra stress and friction, resulting in injury. Ankle sprains. People with high arches tendon to carry excess weight on the outside of the foot, rather than a more balanced distribution. This uneveness creates chronic tension in lateral ankle ligaments, which causes them to lose stability over time. Feet in this condition are more prone to rolling inward during activity, leading to a sprain. Fifth metatarsal fractures. 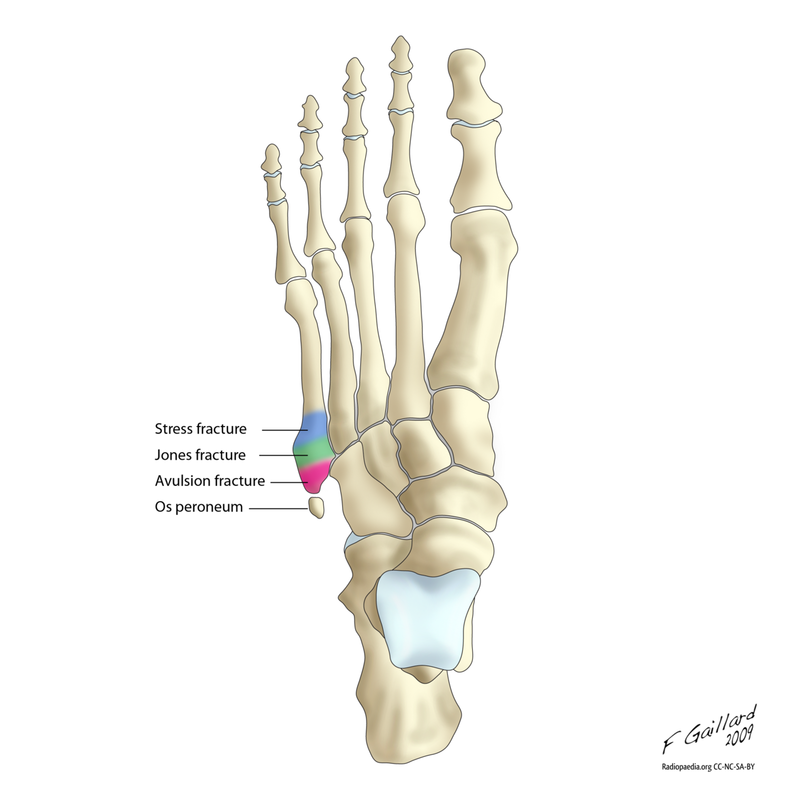 The fifth metatarsal is a long, thin bone on the outside of the foot. In high-arched feet, the fifth metatarsal must endure increased levels of contact with the ground, bearing more weight that it's normally designed to handle. Under this pressure, tiny cracks called stress fractures may form. At the same time, an overly tight peroneus brevis tendon (which attaches to the fifth metatarsal) may begin to pull off tiny fragments of bone at the insertion point. Fortunately, conservative remedies often do wonders for this foot condition. Custom orthotics with a heel flange and a cutout for the first metatarsal can alleviate much of the pain by relieving pressure and rebalancing the foot. An extra cushioning insert for the heel and ball of the foot can help absorb trauma from landing on these areas. Shoes with high tops and wider heels can stabilize the ankle joint. There are many designs of ankle-foot braces that help with instability as well. These can increase your balance and lessen the risk of falling, as well as support the ankle and reduce pain from overextending your joints. Finally, if none of the less invasive measures bring the relief you need to function normally and without pain, you can always consider surgery for cavus foot. There are many possible procedures, depending on how your foot is structured. Some involve transferring tendons to better hold bones in place, and others remove small sections of bone or add a wedge to make the structure more stable and efficient. If you suspect you have high arches and are developing painful symptoms, call Dr. Shine John, DPM, FACFAS of Austin Foot and Ankle Specialists for an appointment by dialing (512) 328-8900, or schedule online if you prefer. We constantly redefine podiatric care by keeping up on the latest information and techniques, so you know your feet are in good hands.